Good things really do come in threes. Three wheels, that is. Piaggio’s newest scooter, the MP3, is the coolest machine this motorcycle enthusiast has ever ridden. The scooter’s three-wheeled design—with one 12-inch wheel in the back and two up front—provides exceptional agility in traffic and maintains comforting stability at high speeds. The two independent, tilting front wheels, which enable up to a 40-degree lean, allow for precision cornering with no fear of spilling. 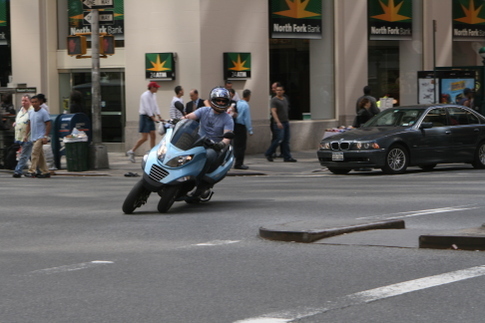 And they handled New York’s infamous pot hole-laden streets with ease—something most scooters struggle with because a single front wheel is more likely to slip. I believe that scooters are one answer to the growing problem of pollution and global warming! They are perfect for commuting within a city, or for any short trip.